Sing, the final major animated film of 2016, can be described using six words: great soundtrack, generic story and artwork. After enjoying Disney/Pixar's strong animated slate this year (Zootopia, Finding Dory, Moana) with Focus' Kubo and the Two Strings arguably an even better experience, it's hard to see Sing as more than an enjoyable toss-in at the end. With its strong pop tune-saturated soundtrack (songs spanning more than sixty years), the film stands poised to make plenty of money on iTunes but whether it will have a major box office impact remains to be seen. The film will probably play a little stronger to younger audiences than older ones - a distinct change-of-pace from 2016's other top animated contenders. As with Zootopia, Sing is set in a world where anthropomorphic animals take the place of human beings (there's not a person to be seen), although less thought is put into the cultural and societal impacts of the inter-species mixing and matching. Thematically, the movie falls back on standard, positive ideals like "follow your dreams" and "friends are important." Although it's hard to criticize an animated movie for embracing such child-friendly conceits, it nevertheless feels a little shallow. Most of Sing's creative energy was invested in the musical numbers and, fortunately, that's where it shines. But the film really can't go toe-to-toe with heavyweights Zootopia, Moana, Dory or even the little-seen but superior Kubo. The central figure in this all-animal ensemble is the koala Buster Moon (voice of Matthew McConaughey), a theater director trying to regain his mojo before the bank repossesses his theater. For his last-ditch effort, he decides to stage a singing competition. Although the top prize is supposed to be $1000, a clerical error adds a couple of zeroes and Buster finds himself in even bigger financial straits than before. The generous sum attracts talent from far and wide: Mike (Seth MacFarlane), a sleazy mouse with a voice like Frank Sinatra; Rosita (Reese Witherspoon), a stay-at-home mom to two dozen piglets; Ash (Scarlett Johansson), a punk rock porcupine with a desire to escape out of her philandering boyfriend's shadow; Johnny (Taron Egerton), a gorilla who has trouble balancing singing with his job as a driver for his bank robbing father; Meena (Tori Kelly), a teenage elephant with acute stage fright; and Gunter (Nick Kroll), a flamboyant pig who's equal parts Liberace and Lady Gaga. Visually, the movie offers enough to avoid being compared to a TV cartoon but it's considerably behind all of 2016's high-end competition (except the exceedingly uninspired most recent Ice Age sequel). Nothing about the look of Sing stands out. The voice cast is high profile, with A-listers Matthew McConaughey (also in Kubo), Reese Witherspoon, and Scarlett Johansson headlining a troupe that co-stars Seth MacFarlane, John C. Reilly, and Taron Egerton. All of the actors do their own singing which, in most cases, proves to be a plus. Nearly all of the purported 80+ songs featured in Sing (many of which are accorded only a few seconds of screen time) are pop hits of the past and present. There's only one new high-profile composition: the Stevie Wonder/Ariana Grande duet, "Faith." There's an unintentional tribute - the Tori Kelly rendition of Leonard Cohen's "Hallelujah" takes on greater depth now that the singer/songwriter has died. 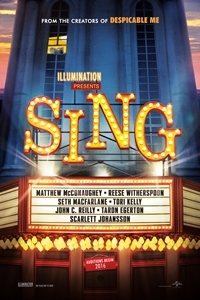 Other notable songs re-sung by members of the cast include MacFarlane's Sinatra-trio ("My Way", "Come Fly with Me", "Fly Me to the Moon"); Reese Witherspoon doing Taylor Swift ("Shake it Off"), Katy Perry ("Firework"), and Survivor ("Eye of the Tiger"); Matthew McConaughey's rather bizarre interpretation of "Call Me Maybe"; Nick Kroll going Gaga with "Bad Romance"; and Taron Egerton crooning Sam Smith's "Stay with Me." Also getting some screen time are classic recordings by (among others) The Spencer Davis Group ("Gimme Some Lovin'") and Christopher Cross ("Ride Like the Wind"). Sing is undeniably a crowd-pleaser - an almost sure-fire guarantee for an optimistic movie about a bunch of down-on-their-luck losers following their dreams, finding themselves, and triumphing. It's a solid late-year destination for families in search of something to do during the long week of school vacation between Christmas and New Year's Day. As enjoyable as it is, however, it's hard to imagine Sing getting much attention after its first few weeks of box office cheer. This isn't the kind of animated film likely to remembered five or ten years from now. It's an ephemeral pleasure but a pleasure nonetheless.